You might have heard the word bocchan in anime before, being used by maids and butlers to refer to a boy whom they serve, their "young master." But what's the real meaning of bocchan in Japanese? The word bocchan written in Japanese is bocchan 坊っちゃん. Sometimes it's spelled without the small tsu っ showing as kana, but still pronounced the same: bocchan 坊ちゃん. This chan is the honorific suffix (san, chan, sama) by the way. It's diminutive. The most common, most simple translation for bocchan is "young master." This happens because, most of the time, the bocchan in question is the son in the family where the speaker serves, and the speaker is often a butler or maid character working for that rich family. 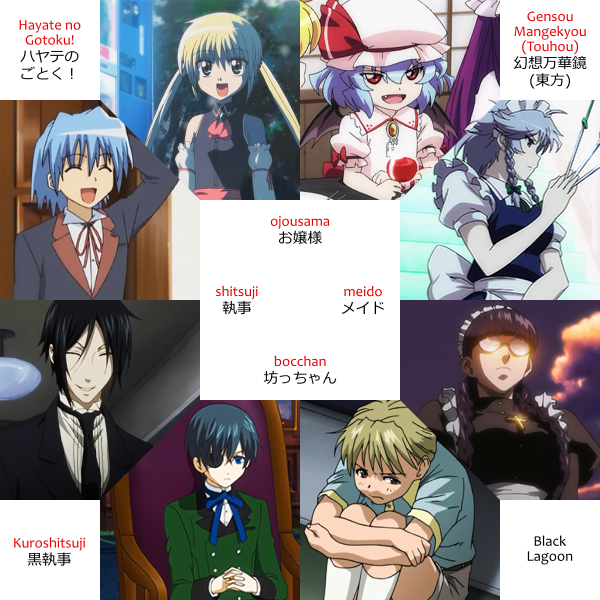 This usage of bocchan is particularly common because maid and butler characters are popular. Since servant characters are popular, and servant characters must serve somebody, you end up needing a rich boy and girl character for them to serve, which would be the bocchan and its female counterpart, ojousama お嬢様. In maid cafés, where customers are referred to as goshujinsama ご主人様, "master," by the maids, their sons may be referred to as bocchan, "young master," instead. Of course, this usage isn't limited to maids and butlers. 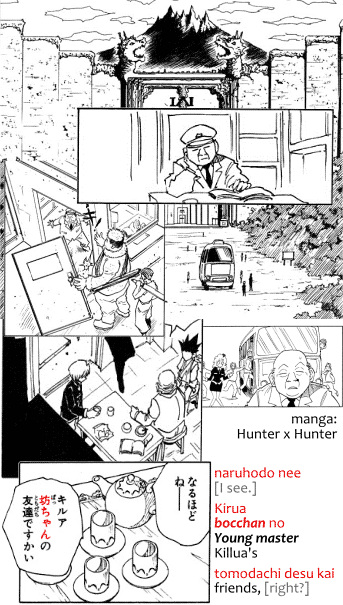 Other servants like drivers, private security guards of the mansion, cooks, etc. may also use the word like this. It's just that these types of characters are less common. 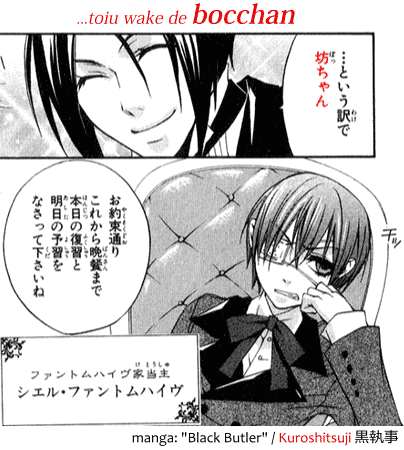 Sometimes bocchan isn't used to refer to someone's "young master" but to call someone a "rich boy" instead. A boy coming from a rich family. This extends the previous meaning: since those who're called bocchan, "young master," are from rich families that can afford servants, getting called bocchan implies you're from a family that can afford servants too. Following that, sometimes the word bocchan is used mockingly, implying the bocchan in question is naive, unaware and ignorant of how the world works, for he has lived a sheltered life so far under the care and protection of his family. Remember: bocchan is a rather affectionate way of calling children. So using it mockingly is like saying in English: "what you gonna do? Cry to your MOMMY?" Because "mommy" is an affectionate word, and there it's used mockingly. The difference is that bocchan refers to the son himself instead. In this case, you could say, for example, "go home, it's dangerous for a bocchan like you here," to say a rich, naive kid has no business around these parts. Sometimes bocchan simply refers to a "boy" without any weird qualifiers. That is, it refers to young child, who's a boy, and it's an affectionate way of saying that. Imagine a woman who's a shopkeeper looking at a boy who just arrived alone in her store saying "do you need help, bocchan?" that is, "do you need help, boy?" Something like that. In this usage, bocchan 坊っちゃん is synonymous with its sibling words bouya 坊や, bouzu 坊主 and bou 坊, all of which share a same origin. Lastly, the word bocchan can also refer to someone else's son. Not yours, someone else's son. So it would be translate as "your son" or "their son" or something. This kind of follows the "boy" meaning above. It's like saying "your boy" or "their boy" then. It's someone else's son only because chan counts as an honorific and you don't use honorifics toward your own family. Similar to how musuko 息子 means "son" in Japanese, including yours, but musuko-san 息子さん normally refers to other people's sons instead. 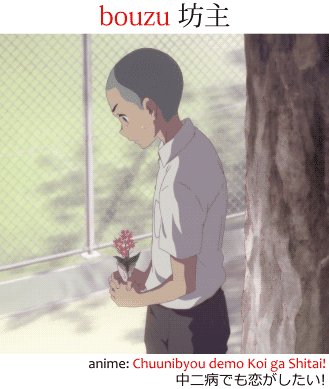 This usage is rarely seen in anime because it would require at least two adults talking to each other. Since the chan of bocchan is technically the chan honorific suffix, the word may also follow the o__san お〇〇さん pattern by having the o 御 prefix added to it: obocchan お坊ちゃん (御坊ちゃん). The word bocchama 坊ちゃま is a variant of bocchan 坊ちゃん. It's supposed to be the sama さま variant of bocchan, but because of how the word sounds, it becomes chama instead. To elaborate: the chan suffix is in a sense a child-fied version of the san suffix which is a sense a casual version of the sama suffix. It's just dumbing down the pronunciation again and again. Since bocchan is a word used toward children, it's like it was baby-speak, except nothing so extreme, it ends up baby-fying the sama suffix too and making it get pronounced chama to match. If it was bossama 坊っさま instead it'd be like adding an adult-sounding suffix to child language, and that wouldn't sound right. Like obocchan, the variant obocchama お坊ちゃま (御坊ちゃま) also exists. Ok, so we have a bocchan with a chan, and a bocchama with a sama (sorta), what about the san suffix? Is there something like bossan? Well, no. I mean, yeah. I mean... it's complicated. The word bousan 坊さん does exist, but it has a totally different meaning: bousan refers to a "Buddhist priest," not to an aristocratic boy. Wait, what? How is that possible?!?!?!? What sort of relationship do priests have with boys?! It has to do with the origin of the bocchan word. Basically, long, long ago, like, in the Heian period of long ago, which was started in year 794 and ended in 1185, there was the word houshi 法師, which meant "Buddhist priest," and which people used as a nickname for their children. This happened because, Buddhism being kind of a big deal, such nicknames were sometimes based on Buddhism. For example: the childhood nickname of Oda Nobunaga 織田信長 was Kippoushi 吉法師. Since houshi was a bad word now, but priests were still the good fellows of always, people needed a new good word of reverence for those honorable priests. And that word was bouzu 坊主. The word bouzu 坊主 began to mean "priest" because one bou 坊 referred to a certain area of a city of a certain size (16 chou 町, so... 16 hectares? ), like where the monks lived, for example, meanwhile an aruji 主 is the "lord" of something. So, because monks lived in an entire bou together, they were the lords of a bou, bouzu. Or something like that. So, anyway, the hairstyle is pretty iconic. Given this, the term bouzu-atama 坊主頭, literally "bouzu head," came to refer to that close-cropped haircut the monks had. And, also, the word bouzu itself started to refer to it. In anime, sometimes you can hear the word bouzu being said when there's some sort of punishment game going on. After some challenge or promise, people say, "if this happens, or if this doesn't happen, I'll cut my hair." That's bouzu. Maybe because of this, the word bouzu ended up being used to refer to boys. The specifics I'm not sure about, but it seems that for a while this bouzu haircut was kind of popular, a common parent's choice for their sons' hairstyle. So the word bouzu started being used to refer to boys with a bouzu haircut (you know, just like people call bald people "baldies"). And then eventually to boys in general. So, after this bouzu, lord-of-the-bou, stuff had been established, people went a step further and started using the word bou 坊 alone to refer to priests, and, by extension, to boys. As usual, if you refer to people you need honorific suffixes, so bousan 坊さん was used instead. But there's a difference between a bald adult priest and somebody's beloved child. 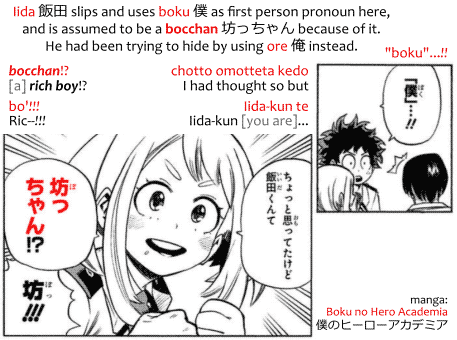 So bouchan 坊ちゃん became the affectionate word used toward the children. And eventually the pronunciation changed a bit, through sokuonbin, and that's how you get bocchan. Note that for a while bousan was actually also used toward boys, but as people settled on using bocchan, they stopped using bousan that way. So today bousan is associated with priests while bocchan is associated with boys. In some places of Japan bou 坊 referred not only to boys but to girls too. A bit unrelated but the word kozou 小僧, literally "small priest," originally referred to a young monk, but nowadays also refers to boys, sometimes translated as "brat." 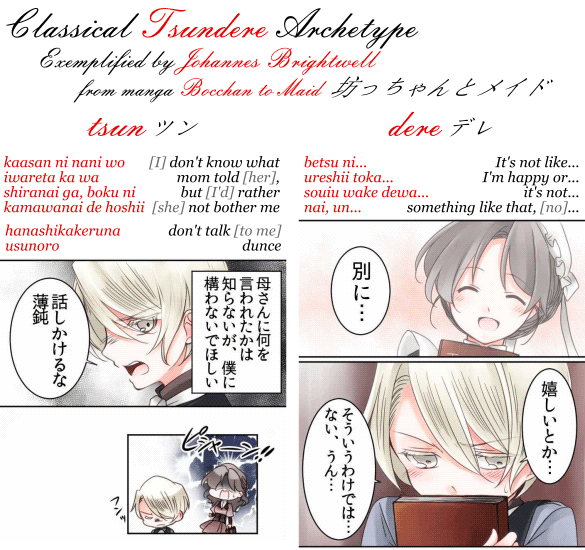 Within the manga and anime fandom, bocchan, the bocchan trope, always refers to the "rich boy" meaning. Often the naive or capricious "young master" with maids, butlers, servants, etc. In particular, this is true not only in the non-Japanese-speaking fandom, but even in the Japanese fandom bocchan refers to that kind of character. Despite the other meanings of the word. Note, however, that there's really no requirement, of personality or appearance, for a character to be classified as a bocchan. All they need to have is money. It's just that the trope, and the fans, tend to favor certain types of bocchan more than just characters who are heirs of fortunes. The appeal of these "rich boy" bocchan characters is, as one would expect, identical to the appeal of its female counterpart, "rich girl," ojousama お嬢様 characters. The appeal of bocchan characters isn't exclusively found in comedy, however. A thought that may never have crossed your mind until you actually think of it, is that, to some people, bocchan characters are moe 萌え. Just like the male audience finds ojousama characters moe, the female audience finds bocchan characters moe. The reasons for this, too, are basically the same. For the reader who only watches harem anime and never saw a reverse-harem anime, let me make this clear: it's literally the same thing, just genders swapped. This means if there's a moe trope you can apply to a girl character, you can apply it to a guy character. Obviously. If you can have a tsundere ojousama, you can have a tsundere bocchan too, and so on. It's also common for bocchan characters to be considered bishounen 美少年, "pretty boys," mirroring the bishoujo 美少女, "pretty girls," ojousama. It's a known fact that men think maid characters are moe. 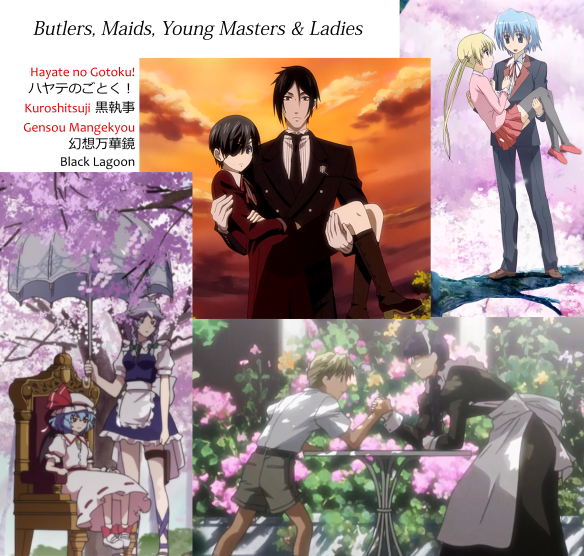 And women think butler characters are moe. Which is why authors like to put them everywhere. But now we know that ojousama and bocchan are also moe. So, in order to increase that sweet, sweet moe-per-capita, some authors decide to go for the whole moe package with one moe master plus one moe servant. Getting twice the moe for your dollar yen. Added to that there's the fact that some people consider master-servant, lord-retainer relationships to be one sort of moe, too. A recurring scenario is a servant who has served a family for years and having watched their young master or lady grow up start thinking of them as family, as their son, daughter, or younger sibling. Other common tropes are becoming deeply indebted, as in, in debt, money, and then indebted to the family who offered a job to pay said debt, or some sort of strong admiration or acknowledgement often involving super-natural stuff. A ship of a bocchan with a butler, on the other hand, is literally gay, therefore falling within fujoshi 腐女子 territory.